What better way to enjoy National Fresh Fruit and Vegetables Month this June than by shopping for your locally grown, fresh produce at a Wichita farmers’ market? Farmers participating in the market must ensure all produce, meat and poultry are grown and raised in Kansas, with priority given to farmers who grow and raise their own produce, meat and poultry using environmentally responsible, healthful and human methods. Vendors may not sell genetically modified crops, or GMOs. Vendors distributing ready-to-eat products, such as honey, bread and beverages, must make the products themselves, with priority given to unique, handmade items and to food products made with market-purchased items or Kansas-produced fresh and healthful ingredients. Artisans must sell products handmade by the artisans – food or not – with priority given to vendors who use sustainable and eco-friendly production. The Old Town Farmers’ Market’s standards ensure vendors provide only the highest quality food and non-food products and so shoppers know they’re getting only the highest quality products. 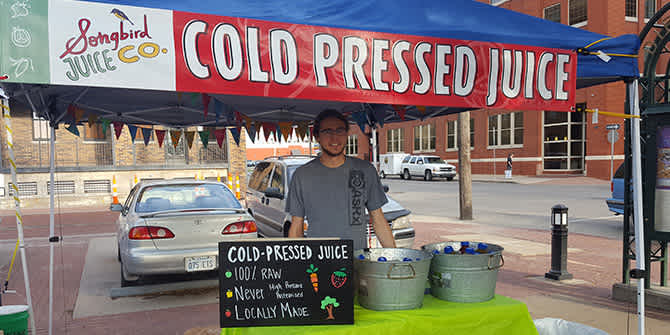 Visit Wichita partners 86 Cold Press and Songbird Juice Co. have regular spots at the Old Town Farmers’ Market. 86 Cold Press serves cold-pressed, 100 percent organic juice in sustainable packaging made in small batches to produce pure, vibrant and stomach-fulfilling juices. Songbird Juice Co. is Wichita’s original cold-press juicer offering more than just juice. With smoothies, acai bowls and Kombucha on tap, Songbird serves 100 percent pure cold-press juice made with mindfully-sourced ingredients in Riverside, College Hill and out of their 1967 Chevy – Sweet Betsy the Birdcage Juice Truck – at area Farmers’ Markets. Need another reason to head to market? The Old Town Farmers’ Market hosts weekly classes and demonstrations, special events and professional gardening and culinary advice to customers at the Information Booth. Kansas Grown! Farmers’ Market the largest grower-owned farmers’ market in Kansas with four locations in and near Wichita. Farmers are sorted into vendor categories by what they produce, including: Arts & Crafts, Baked Goods, Meats, Plants, Produce and Specialty Items, such as jellies, salsa and dog treats. Organic, chemical-free and 100-percent producer products are also labeled so consumers know exactly what they’re buying. Kansas Grown! Farmers’ Market hosts events at its various locations, including chef demonstrations and cooking classes for kids. In addition, this year marks the farmers’ market’s 27th anniversary, so they’re planning special events to celebrate all year long. See Kansas Grown! upcoming events. Lincoln Heights Village, the city’s original shopping center, located on the southwest corner of Douglas and Oliver, also hosts a farmers’ market every Wednesday 7 to 11 a.m. and again 3 to 7 p.m.
For fresh produce all week long, check out one of Wichita’s great grocers, including Dillon’s Marketplace and Sprouts Farmers’ Market. No matter when or where you shop, you’ll be able to find fresh, local ingredients all around Wichita!